Apply to pitch to win a £500 grant award and a Social Finance Mentor for the year! Have you got a social enterprise business idea you want to kickstart? Are you a current social enterprise or entrepreneur looking to diversify or develop a new product or service? As part of Social Enterprise West Midlands Social Finance Fair on the 1st October SEWM CIC is providing up to 4 social enterprises or social entrepreneurs the opportunity to pitch for an agreed amount of seed investment/grant from the Pitchers Platform sponsor and a Social Finance Mentor. Sponsored by BCRS Business Loans the Pitch will take place as part of the conference with a panel of Social Finance experts in front of the event audience. opportunity and explain who is going to buy the product or service! demonstrate how they will measure journey and product/service delivery. If you are interested in applying to pitch and want to find out more please email info@socialenterprisewm.org.uk by the 24th September 2015! * Terms and conditions of mentoring do apply. Mentoring agreement to be decided between the mentoring organisation and mentee. Social Saturday – a UK wide campaign to celebrate, raise awareness and buy from social enterprises – is back on 10th October and based on last year’s success, it’s a marketing opportunity you don’t want to miss. As part of our social mission to ‘do good business and create social value’ we are offering ten DISE clients in Solihull and Birmingham the opportunity to promote their products and services through the power of video. That’s right, ten social enterprises will receive a free mini video which will be premiered on Social Saturday to showcase their wares and help spread the message that it’s good to buy social. Plus, we are also joining forces with Social Enterprise West Midlands to maximise the reach of all the videos produced as part of their online digital showcase campaign for Social Saturday. This offer is open to social enterprises that have previously worked with DISE and are based in Solihull or Birmingham and is available on a first come first served basis. Each mini video will be filmed on location enabling one person per social enterprise to talk about their products and services, business or special offer. The duration of the video will be 30-45 seconds with a title slide featuring a company logo and website and a closing slide acknowledging DISE sponsorship. Minor revisions to final edit only. Filming slots are available on 22nd, 23rd and 24th September and will take approximately one hour per enterprise. All videos produced will be uploaded to the DISE You Tube channel and will be promoted via the DISE Twitter and Facebook accounts on Social Saturday in association with Social Enterprise West Midlands. Participating enterprises must be willing to promote the video on Social Saturday through their own social media accounts and website where available. Featured social enterprises can use their video beyond the Social Saturday campaign as desired. Enabling our clients to make the most of campaigns like Social Saturday is one of the ways in which we reinvest 100% of our profit as a social enterprise. If you are interested in a short video to promote your business on Social Saturday please get in touch with us as soon as possible and register your interest by 12pm on Monday 21st September. Call 0121 667 6810 or email info@disecic.org. 4. 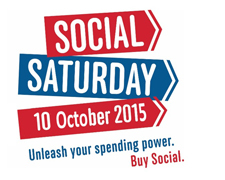 Use the #SocialSaturday2015 hashtag in your tweets and posts. Have you seen TV ads for the Employment Allowance? The Employment Allowance has been open for claims since 6 April this year, however, not many employers are aware of it. The scheme enables employers to reduce the amount of National Insurance contributions (NICs) they pay for their employees by up to £2,000. Social enterprises and charities are eligible and if you usually pay less than £2,000 in National Insurance Contributions, you could be a lot better off! The Government says that up to 1.25 million businesses and charities will benefit from Employment Allowance. Around 450,000 businesses and charities won’t have to pay any employer National Insurance contributions at all. Joining the team at Development in Social Enterprise is Suzanne Detton who will be supporting our business support projects and also taking care of our marketing communications. Suzanne has a degree in Geography from Staffordshire University and her passion for research led her to discover the world of social enterprise whilst on placement with the Aspire Housing Group. “I really enjoyed my first taste of social enterprise and when I saw the opportunity to work for DISE through the Graduate Advantage scheme, I jumped at the chance to apply. Suzanne is based at our Birmingham office and looks forward to being the first point of contact for our clients whether you’re calling or visiting. Development in Social Enterprise are delighted to be working with Worcester Volunteer Centre under the BIG Assist programme. Over the next few months we will be supporting staff, managers and trustees to find creative and enterprising ways to maximise their ability to provide core services to the voluntary and community sector in Worcester. Established in 1986, volunteering is at the heart of their many services which Worcester people rely on each day. Worcester Wheels provides community transport for elderly and vulnerable people clocking up 400 single trips every week. Your Helping Hand provides dog walking, shopping and gardening services to enable people to remain safe and independent in their own homes for as long as possible. Their supported volunteering programme Choices has already helped 100 young people by giving them the extra support they need to enjoy the many rewards volunteering can offer. There are also a number of organisational development and business training courses on offer plus local organisations accessing the Creative Partnerships voucher scheme need look no further for marketing and funding consultancy. All these projects and services and more are detailed on the new Worcester Volunteer Centre website. If you’re interested in learning more about our work with Worcester Volunteer Centre please contact us on 0121 667 6810 or email info@disecic.org.